This grilled potatoes recipe makes the perfect side dish alongside any meat. Dicing potatoes and putting them in a foil packet on the grill makes for a perfect surprise when you pull them off the grill. The grill steams the potatoes and seasonings together inside the foil package, resulting in a spiced, smoky flavor. If you aren't a spicy food person, feel free to remove the jalapeno and cayenne pepper from this recipe. Also, if you have some picky eaters joining you at the table, you can make individual foil packets and include different ingredients that are customized to their liking. Don't be afraid to add other vegetables to this grilled side dish recipe like mushrooms or zucchini. Peel the skin off and dice your potatoes into bite size pieces. Cut your jalapeno, 1/2 onion, and 1/2 green bell pepper into the smallest pieces you can chop. If you leave these in large pieces, you might get a bite of overwhelming onion or spicy jalapeno. Mix all of your potatoes and chopped vegetables together. Also mix in all of the seasoning ingredients in with your vegetable mixture (garlic, cayenne, salt, and pepper). Lay a large aluminum foil sheet out on the counter and place 1 tablespoon olive oil or butter on the sheet and place all of the chopped veggie ingredients on top. Then place the remaining 1 tablespoon of oil or butter on the top of the vegetables. Wrap your mixture completely in the foil by making a package. Lay out another sheet of foil and wrap another layer of foil around your package. This second layer of foil will ensure that your package holds up on the grill, especially when you need to flip it half way through cooking it on the grill. 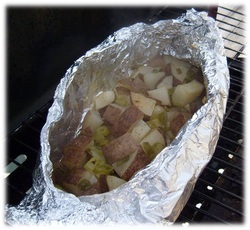 Place your potato side dish foil package directly over the flame on medium-high heat on the grill. Your potatoes will take about 50 minutes to 1 hour. Flip your foil package after 30 minutes. Pull your potatoes off the grill and open the foil to place shredded cheese and sour cream on the top. Make sure to place these topping ingredients soon after you take them off the grill so they still have enough heat to melt.